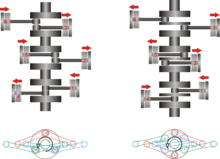 The boxer configuration is the only configuration in common use that does not have unbalanced forces with a four-stroke cycle regardless of the number of cylinders, as long as both banks have the same number of cylinders. They do not require a balance shaft or counterweights on the crankshaft to balance the weight of the reciprocating parts, which are required in most other engine configurations. 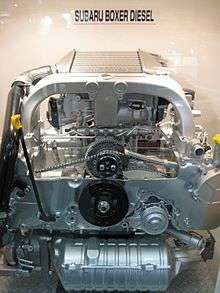 However, in the case of boxer engines with fewer than six cylinders, unbalanced moments (a reciprocating torque also known as a "rocking couple") are unavoidable due to the "opposite" cylinders being slightly out of line with each other. Other engine configurations with natural dynamic balance include the straight-six, the straight-eight, the V12, and the V16. The first motorcycle with a boxer engine was the 1905 Fée flat-twin, which was developed into the 1907 Douglas. Douglas would continue making flat-twin motorcycles until 1957, ending with the Dragonfly. BMW have made motorcycles with flat-twin engines since the BMW R32 of 1923. 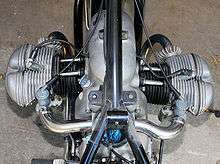 Unlike contemporary Douglas motorcycles, which had their engines mounted with the cylinders in line with the frame, the R32 had its cylinders mounted across the frame and used a shaft to drive the rear wheel. The drivetrain layout of the R32 has been used, with improvements, in all subsequent BMW flat-twin motorcycles. The Russian Ural and Ukrainian Dnepr flat twins were licensed copies of the pre-WWII military plunger-suspension BMW R71. The low centre of gravity allowed by a flat engine can reduce body roll in automobiles and enhance handling precision. Historically they could be found in cars manufactured by companies such as Porsche, Alfa Romeo, Benz, Ford, Tatra, Citroen, Jowett, Rover, Volkswagen, Chevrolet, and Ferrari. 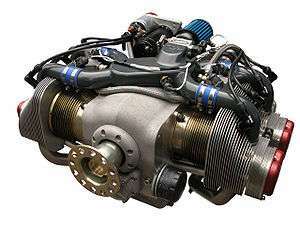 The most prominent manufacturers currently using a boxer engine as their primary engine configuration are Porsche and Subaru. Examples with rear-engine, rear-wheel-drive layouts include the two-cylinder BMW 600 and 700, four-cylinder Tatra 97, Volkswagen Beetle and Porsche 356, and the six-cylinder Chevrolet Corvair, Porsche 911, and Tucker 48. All of these examples except the Tucker and later versions of the Porsche 911 are air cooled. Examples with front-engine, front-wheel-drive layouts include two-cylinder Citroëns and Panhards and the four-cylinder Citroën GS, Alfa Romeo Alfasud, Lancias from the Flavia to the Gamma, and Subarus DL and GL. The Citroëns and Panhards are air cooled while the Lancias, Alfa Romeos and Subarus are water cooled. Ferdinand Porsche developed the KdF-Wagen partly based on the Tatra 97. Like the 97, the KdF-Wagen had an air-cooled flat-four engine The KdF-Wagen was renamed the Volkswagen and a limited number were made before World War II. The factory was reopened after the war, and the Volkswagen became a commercial success in its own right, and also became the base for other designs, including the Type 2 (bus) transporters, the Karmann Ghia, Volkswagen Type 3 cars and the SP2 sports car. The last versions of the Volkswagen boxer were watercooled and thus dubbed the Wasserboxer (waterboxer) by enthusiasts. This engine included many developments of the earlier engines. It was offered in capacities of 1.9 and 2.1 litres was used to power T3 buses and transporters. In 1960, Chevrolet introduced the Corvair, a compact car with a rear-mounted air-cooled flat-six. A combination of design features, including the rear weight bias and the use of swing axle rear suspension, increased the probability of lift-off oversteer. Incidents of lift-off oversteer ruined the Corvair's reputation, and the car was discontinued in 1969. The flat-four engines in Alfa Romeo's Alfasud, Sprint, 33 and early versions of the 145. The last of the line was a 1,712 cc flat-four, 16-valves, producing up to 137 PS (101 kW). Ferrari made use of a flat-twelve design in several models, including the Berlinetta Boxer, the Testarossa and their derivatives, although this engine design is technically a V12 that has been flattened down to a 180° configuration, and therefore cannot be regarded as a true boxer engine. Some Porsche sports racing models, including the 908 used flat-eight engines. The flat-twelve in the 917 model is a 180° engine was a boxer engine and later Followed by Ferrari Berlinetta Boxer (BB 512) used 180 degree Flat 12 for Le Mans to compete with Porsche but Ferrari BB 512 used on road going cars unlike Porsche. Since the Subaru 1000 of 1966 the water-cooled front-mounted flat-four and flat-six engines have been used by Subaru in all of its mid-sized cars, including the Impreza, Legacy, Outback, and SVX. The Forester and Tribeca SUVs, BRAT and Baja pickup trucks, and BRZ sports car also use boxer engines. Subaru refers to these as boxer engines in publicity commentary, and include a variety of naturally aspirated and turbo driven engines from 1966, when the Subaru 1000 was introduced to current; both closed and semi-closed short blocks have been used. A print ad for the 1973 Subaru GL coupe referred to the engine as "quadrozontal" The EJ series of four-cylinder engines released first in 1990 has been the focus for the development of the boxer engine in the late 20th century. Ranging from 1.6–2.5 litres, this engine in its 2-litre turbo arrangement has been the power behind World Rally Championship winning cars. Subaru also offers a common rail boxer turbodiesel, called the Subaru EE series, the world's first to be fitted into a passenger car. In a joint venture between Subaru and Toyota, a 1,998 cc flat-four engine with 200 PS (147 kW) having GDI was developed as the Subaru (FA20) and Toyota (4U-GSE). This was used in the two-door coupe Toyota 86. The Lykan HyperSport, the third most expensive car in the world as of 2015, uses a Porsche-derived flat-six engine. 1 2 3 4 5 English, Bob (2010-04-29). "The engine that Benz built still survives". The Globe and Mail. Canada. Retrieved 2013-12-19. ↑ Hodzic, Muamer (2008-03-27). "Mercedes Heritage: Four-cylinder engines from Mercedes-Benz". Blog. BenzInsider. Retrieved 2013-12-20. 1 2 3 4 Bonk, Aaron (2013-02-07). "How Boxer Engines Work". Super Street Magazine. Source Interlink Media. Retrieved 2013-12-21. 1 2 3 Hanlon, Mike (2001-02-07). "The world's first horizontally-opposed turbo diesel engine". Gizmag. Retrieved 2013-12-20. ↑ Brown, Stuart F. (2009-07-02). "Handlebars - BMW's Boxer - A Classic Design Is Updated and Refined". New York Times. Retrieved 2013-12-20. ↑ Brown, Warren (2013-12-13). "Subaru Impreza is fun, reliable but has darned noisy engine". The Record. Retrieved 2013-12-20. ↑ "Range of our Engines ‹ Low cost, High value". Verner Motor. 2014. Archived from the original on 2014-10-06. Retrieved 2015-12-28. ↑ Szymezak, Pascal. "Début de la légende". La saga GoldWing (in French). Fédération des GoldWing Club de France. Retrieved 2013-12-20. ↑ Cameron, Kevin (2012-12-21). "BMW's All-New Water-Cooled Boxer – Tech Preview". Cycle World. Bonnier Corp. Retrieved 2013-12-20. ↑ Nunney, M. J. (1988). Light and Heavy Vehicle Technology. Oxford, UK: Heinemann Professional Publishing. p. 12. ISBN 0 434 91473 8. Retrieved 2015-05-08. ↑ Nunney 1988, pp. 12–13. 1 2 "The Wilson-Pilcher Petrol Cars". The Automotor Journal. 1904-04-16. ↑ "The Buffum Automobile". Farber and Associates. 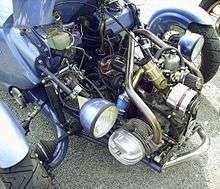 ↑ "Citroën GS + GSA boxer engine". Citroënët. Retrieved 2013-12-20. ↑ "Citroën DS the birth of the goddess". Citroënët. Retrieved 2013-12-20. ↑ "Flat-12 engine". Ferrari.com. Ferrari S.p.A. Retrieved 2013-12-21. ↑ "» Vintage Subaru Ad (1973 The Subaru GL Coupe)". Scoobyblog.com. Retrieved 2010-09-18. ↑ "Greencarcongress". Legacy Diesel Announcement. Retrieved 2008-01-23. ↑ Harwood, Allyson (January 2008). "2008 Subaru Turbodiesel Boxer - First Drive". MotorTrend Magazine. Source Interlink Media. Retrieved 2013-12-20. ↑ "A True Engineering Revolution". SUBARU BOXER DIESEL. Fuji Heavy Industries Ltd. Retrieved 2013-12-20.